Lens-Artists Photo Challenge – Splash! This week, Patti Moed asks us to focus on water in motion, specifically the displacement of water into the air, preferably with some force. OK, that’s a pretty dry explanation of what Patti challenged us to provide. I better let her say it… she did it so much better than I. You can read her challenge post here. 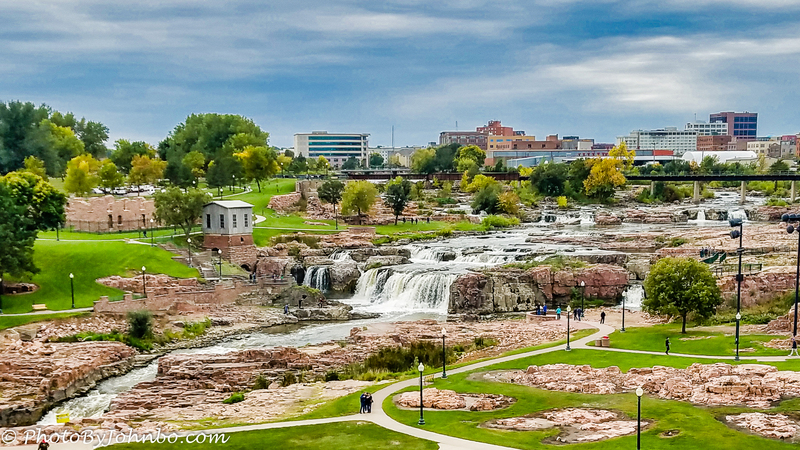 The first two photos of my challenge response features Falls Park in Sioux Falls, South Dakota. As you can see by the image, there is a lot of splashing going on as the Big Sioux River changes levels several times in its trip from its source. In all, the river drops 800 feet from its source in Roberts County, South Dakota to its destination of the Missouri River. 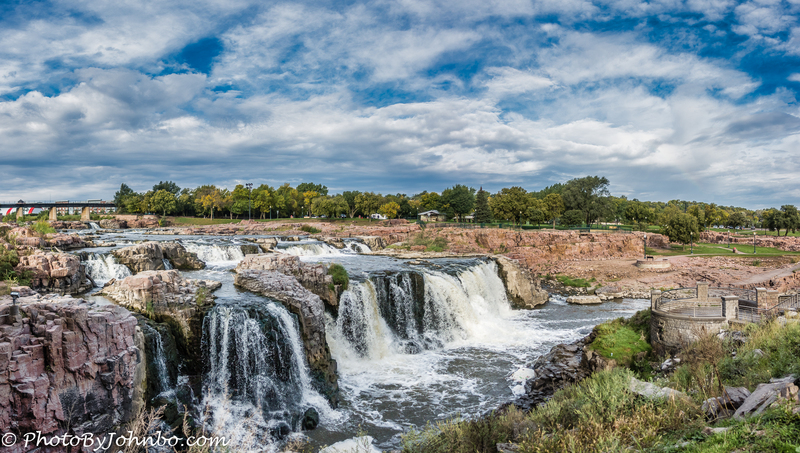 The largest drop in Falls Park is featured in the shot above on a chilly late September day. The energy creating the splash at Falls Park is due to a 100-foot (30 m) drop. The flow rate is estimated at about 7400 gallons per second. November, 2013 found us on the Hawaiian island of Kauai. 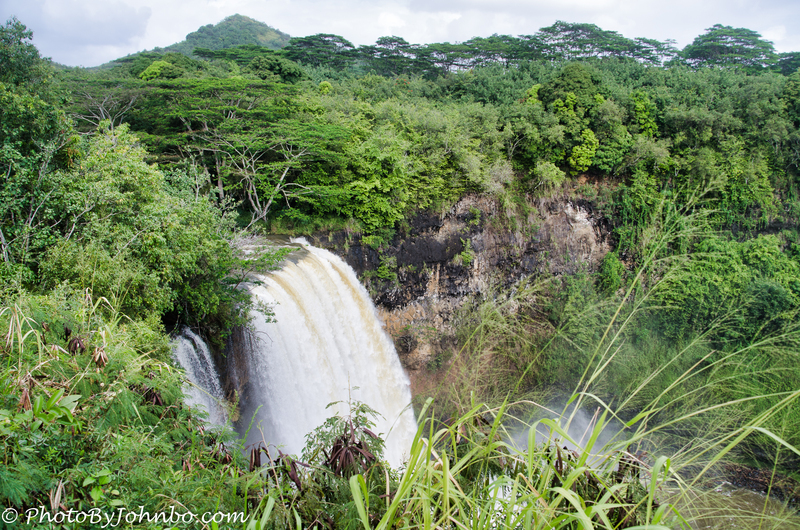 During our tours of the island, one stop of interest was Wailua Falls near Lihue. If the parking area isn’t full, it’s a short walk to the 175-foot (53 m) drop into the pool below. On most days, visitors will see a bifurcated flow with water spilling around either side of a large rock outcropping. Near the end of our stay, a day of heavy rain in the mountains above Lihue created lots of extra runoff down the Wailua River. The day after the rain, we again visited the falls to find that the large outcropping completely disappeared under the large flow of water. The mist from the splash from all that water rose to the point where it is visible in the shot above. 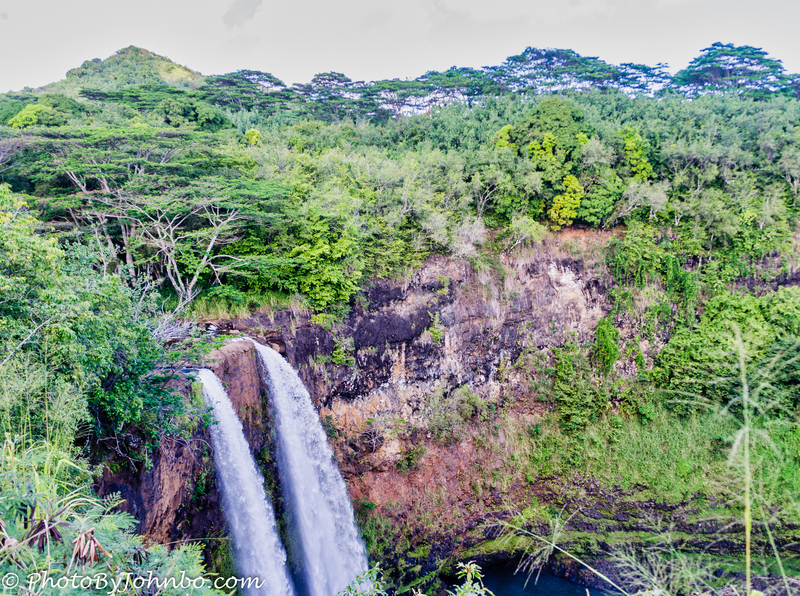 My last ‘big splash’ is but a few miles from Wailua Falls on the north side of Kauai. 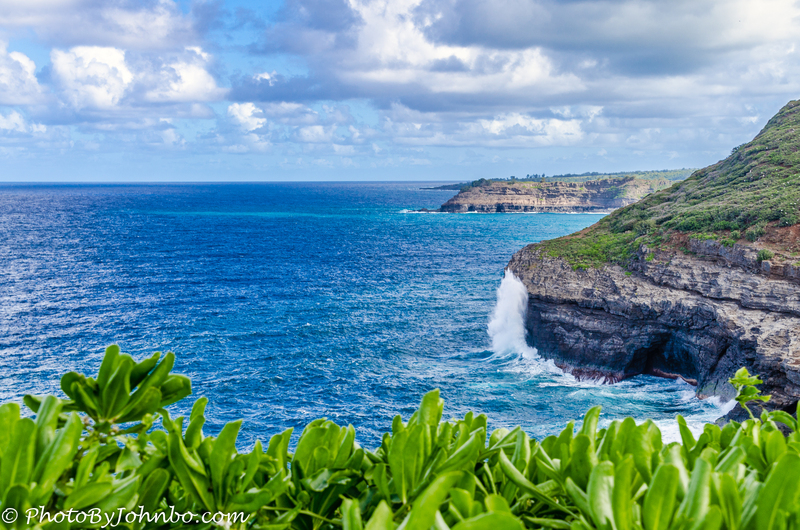 From Kīlauea Point Lighthouse, a view to the east provides hours of fascination to visitors as wave after wave strikes the island. It became a game for me to attempt to capture the highest splash made as the waves crashed into the island. It was fascinating to see how different was the strength of each splash. Some waves barely generated a bit more than the white caps while most came up at least half-way to the ledge at the dropoff. I have no real idea as to the height of the dropoff from the point where the coastline slopes upward, but I’d guess a hundred feet (30 m) or so. That day I made probably 30 attempts to capture the splash at its highest. The shot above features the largest splash I witnessed that day. What is missing from this post is the roar of the waves as they continuously pounded the northern shore of the island. As this post is being written, it’s the beginning of the Christmas season. I’ve been listening to a collection of holiday music via Internet streaming. Coincidently, the Hawaiian Christmas song made popular by Bing Crosby in the 1950s is playing. For those who celebrate the season, I can wish you “Mele Kalikimaka,” Merry Christmas loosely translated into Hawaiian. In most browsers, clicking on an image will enlarge it for a better view, something I’d recommend especially for that opening image which contains a lot of fine detail. You go to some beautiful places, once again I find myself traveling vicariously via your blog. Thanks for the travels! I am fortunate to have the time to see so much of this great country. Live your opening shots John. A place I’ll never see first-hand so appreciate even more! So much beauty in this splash-album, John! You really have an eye for a beautiful picture, that’s for sure! Thank you for the nice compliment. This was a fun challenge.